1973: the year in which his daughter was born was also Heaney’s first late winter/ early spring experience in Glanmore cottage: the family has lived there for scarcely half a year. The poet’s Curriculum Vitae now reads ‘Occupation: poet’ … he is self-employed with a growing family to feed, without a regular University Lecturer’s salary coming in and with bills to pay. He has no alternative but to get on with the job! March came in like a lion: confined to his work-desk the poet is conscious of winds on creaking roofs (corrugated iron growled like thunder); then Spring in the air (the year turned warmer), when the sick ventured out and shoots appeared (invalids and bulbs came up from under). For a poet with deadlines to meet, however, winter dragged on (I hibernated on behind the dormer) preoccupied (staring), seeing the world outside through shaken branches; cut off as his ailing father would be from society (dissociated); rendered oblivious to the passing of time (chloroformed) in a poisonous reek of cigarette smoke and dropped ash. Lent witnessed no respite from the weather (also like a lion). 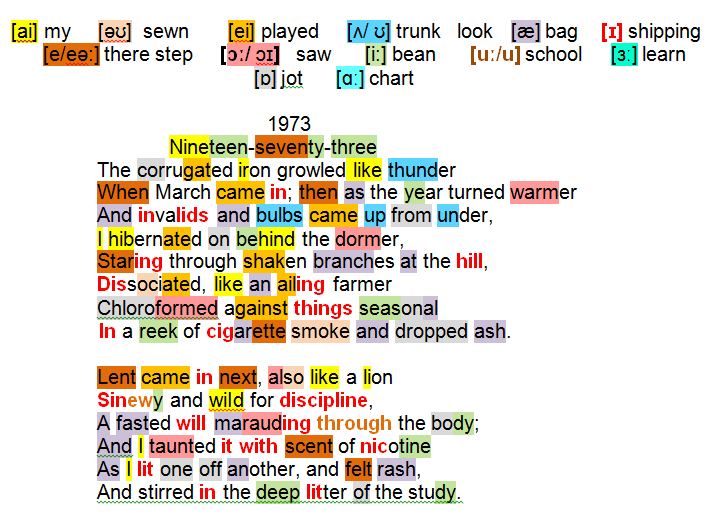 Heaney has lost weight (sinewy) is driven by the pangs of hunger (wiId for discipline) … poetic composition precedes bodily sustenance (a fasted will marauding through the body) … man showing reckless disregard for health (taunted it with scent of nicotine) and chain smoking (lit one off another). The poet in hibernation begins to awaken (stirred) and feels replenished (rash). Around him is the den to which he confined himself (the deep litter of the study) filled with the the crumpled sheets of drafts and sundry writerly detritus. DOD (235) Heaney regarded the cottage as workspace, first and foremost… also a retreat. It remained what it always had been, the poetry house. It’s a silence bunker, a listening post, a holding, in every sense of that word. It holds meaning and things, and even adds meaning … the imagination pressing back against the pressures of reality.